There is a lot weighing on my heart in this moment, and I don’t quite know how to phrase it. So I pray right now, Lord Jesus, that you would intercede. Today I had a really enlightening conversation with one of my professors, and it moved me to pray. And I experienced some incredible revelations in who our Lord is. it will never be my theological wording or prompts or behaviours that affect or alter who He is, and who He makes Himself to be in the this world. I live by grace through faith alone, and while that is an overwhelming reality, if I am in accordance with His Spirit, it will be received by others as the Truth, too. Ultimately, “I” am not the important element, but rather Him in me just Him. Paul’s twelfth chapter in the book of Romans is broken into three parts often named a Living Sacrifice, Humble Service in the Body of Christ, and Love in Action. The humble service He calls us to is not one of frustration, anger, or spite against others. Rather he reminds us that, “ If it is possible, as far as it depends on you, live at peace with everyone” (Romans 12: 18). As there is less of me and more of Him, my spirit feels less called to share and write and “post,” as He just is. I have unlimited faith that He can do it, because He already did it. I am blessed by a lot of model servants of the Kingdom in my life, Christ inside of them living a serving, and not boastful or anxious life. Rather than modelling or looking to them, I have been granted a peaceful spirit by my Saviour, that He will do it. He is doing it. He is the life-source. Sometimes it is just quiet moments, just me and Him. Other times it is in the places of the most noise and “world chaos.” Because He is. And what is His love in action? Romans 12:9-16 Love must be sincere. Hate what is evil; cling to what is good. Be devoted to one another in love. Honor one another above yourselves. Never be lacking in zeal, but keep your spiritual fervor, serving the Lord. 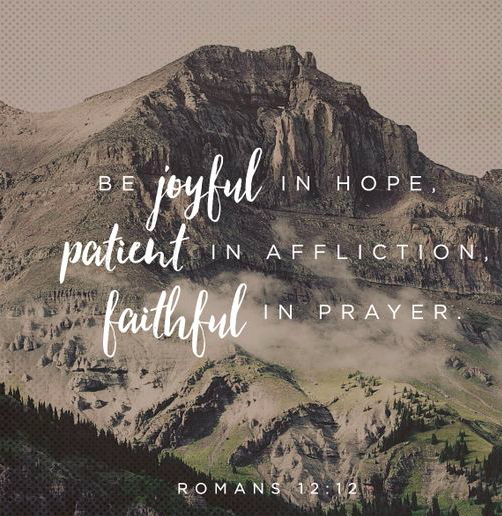 Be joyful in hope, patient in affliction, faithful in prayer. Share with the Lord’s people who are in need.Practice hospitality. Bless those who persecute you; bless and do not curse. Rejoice with those who rejoice; mourn with those who mourn. Live in harmony with one another.Do not be proud, but be willing to associate with people of low position. Do not be conceited.